I picked this bad boy up from the shop a few weeks ago at the recommendation of Amanda Egle, a youtuber. I'm so glad I did. 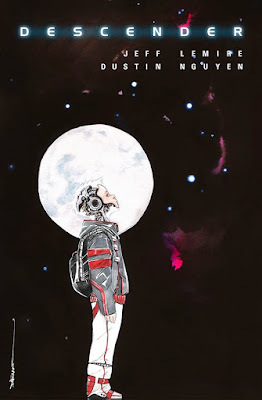 Descender is Jeff Lemire and Dustin Nguyen's newest Image release. It's currently about two issues in and fantastic. The story follows a futuristic human civilization where the only real hope for humanity's survival lays in the hands of a washed out robotics engineer and a long abandoned AI boy. Ten years after an attack on humanity by a giant robot, Dr. Quon, is the world's only real hope at its defeat, but he has abandoned the pursuit and wallowed in his own inability to save the human race. Artificial intelligence has been made illegal and robots with AI-capable processors are destroyed, limiting Quon's access to the machinery he could use to save the world. Until Tim comes back online. As a general matter I shy away from superhero stories other than those being told by the "Big 2", as I feel like if I'm going to read a superhero story, I'd rather just read an established hero and universe rather than learn a new one. However, alternative superhero stories, at their best, can be used to explore ideas that you'd never get to do at Marvel or DC because they'd upset the status quo too much. The most successful example of this, of course, is Watchmen, which explores the terrifying notion of what it might actually be like to live in a world of heroes. Other great examples are Astro City (exploring what it's like for the regular people living in a world full of superheroes), Irredeemable (exploring what happens when a Superman-like figure goes insane) and Jupiter's Legacy (exploring a world where the superheroes have families and their children fall far from the heroic tree). 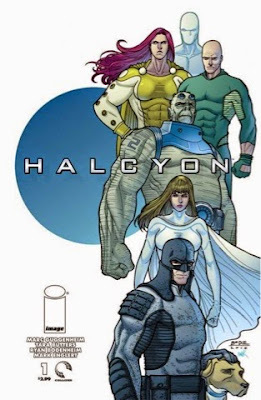 Another series that belongs in that category (and I think was under appreciated when it came out) is Halcyon, written by the accomplished show running team of Marc Guggenheim and Tara Butters, with art from Ryan Bodenheim and colors from Mark Englert. The central premise of the story here is "what happens when the eternal fight for truth and peace and justice is over?" The worlds great super villain, Oculus, decides that the greatest way he can defeat the heroes of his world (their Justice League equivalent is known as Halcyon) is to render them obsolete. So he makes it impossible for any human being to commit a violent or aggressive act. Even thinking about how to commit such an act will cause a person pain. So there is a universal peace, but it's enforced externally. Some of the heroes are happy about this as they're more than willing to hang up the cape and tights. Some are without purpose, and some are willing to fight to the death to restore the world to its former state, even though it means giving up peace, because of their belief in the right of human beings to free will. It's an extremely compelling story. There are analogues for a number of prominent superheroes (Superman, Batman, The Flash, Beast, Captain America), but there are enough differences so it doesn't feel too on-the-nose. Ryan Bodenheim does spectacular work in this book. 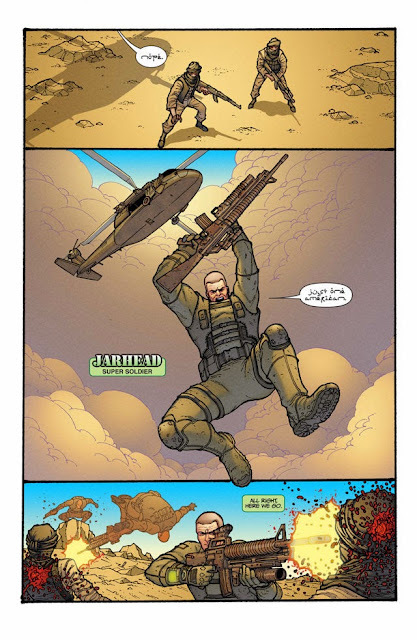 He's got a gritty, kinetic, detailed style that works well for both action and quieter scenes. He's complemented with strong coloring from Mark Englert who shows a great range in this series, from the desert to undersea to weird prisons, all vividly colored. I'm also a fan of the lettering work from Dave Sharpe in this book, particularly where each time a new hero or villain is introduced, their name is written in a distinctive font style that suits their character perfectly.